Soups, stews, curries. Mashed or whole. Grated, sliced, diced. Raw, roasted, boiled, even pickled. Appetizer, side, or a main. Even dessert in some cases. Are you as amazed as I am? 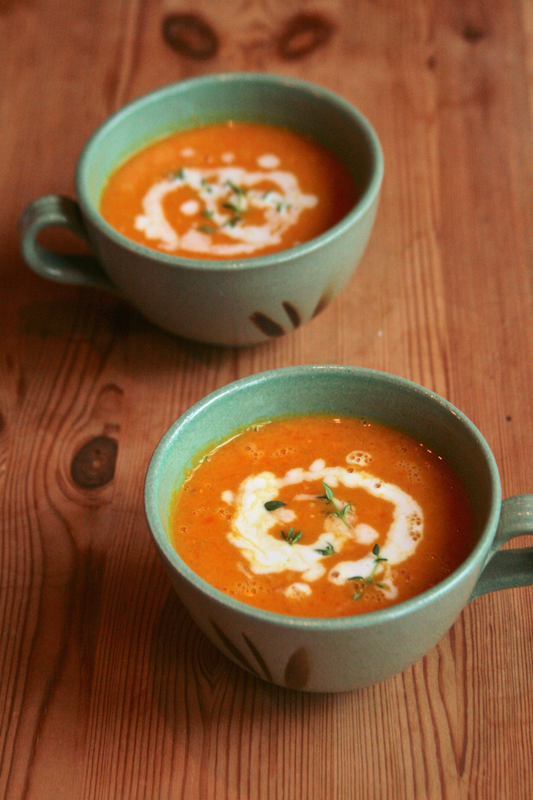 When the weather take a turn for the chillier temperatures, I start making soups and curries out of root vegetables. In the wintertime, there is always a bag of carrots lying around in case a quick and warming dinner is in order. I love how easy carrots are in that regard. Combined with some pantry staples such as lentils, coconut milk, and spices, they quickly will turn into a healthy, comforting dinner. 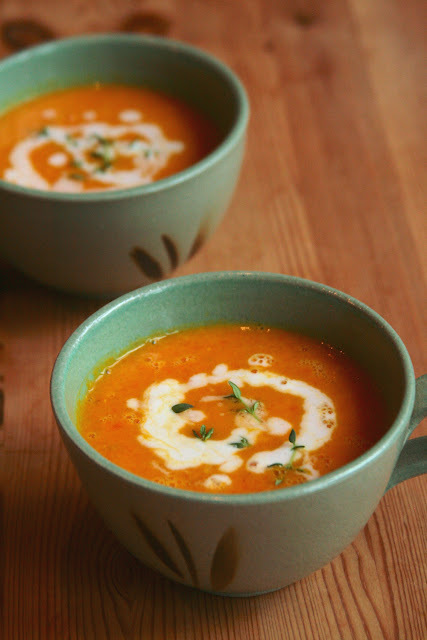 I love the combination of creamy coconut milk and the warming spices; the way they balance each other out and result in a delicious soup. 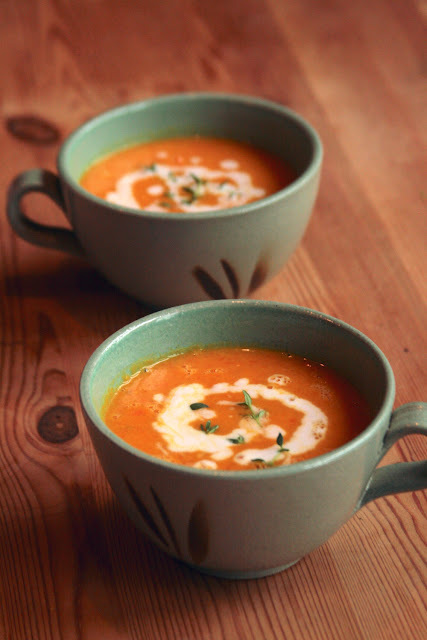 This is the soup for those evenings when all you want is to curl up in a blanket with some soup and a cup of tea, and read a book or watch a movie you've meant to watch for a few weeks nows. And, hopefully, you will stop and smile when you sip down the soup. Smile and start, though maybe slowly, being more aware and appreciate more those beautiful (in this case, orange) root vegetables that are waiting to be used. Peel and dice the onion and carrots. Peel and mince the garlic cloves. In a saucepan, heat the olive oil over medium heat. Add the onion, carrots, and garlic; sauté for a few minutes. Add the spices, and sauté for 30 seconds. Add the lentils and vegetable stock. Bring to a boil and simmer, over medium-low heat, until the carrots are tender and the lentils are falling apart, about 25 minutes. Purée the soup using an immersion blender (or a blender) and thin the soup to the consistency of your liking with the coconut milk. (I used about a cup.) Season to taste with salt and pepper. Spoon what is left of the coconut milk on top of the individual servings. great recipe! great combination of spices, I can just imagine the aroma. oh, divine. this looks like a hug for my tummy! I love all the ingredients in this recipe - sounds so delicious. And, I love your writing style - great post! Thank you so much, that is so sweet! Hi there! Welcome to a dash of faith. I'm Ronja (pronounced like you would Ronya). I am a follower of Christ, a Sunday School teacher, writer of sorts, and I really like food. This blog is where I write about the food that I make, the things that God is speaking to my heart, and anything I find that inspire me.